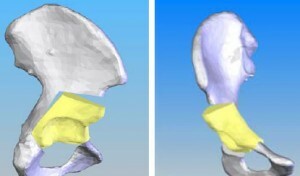 Periacetabular osteotomy (PAO) is a corrective surgery for patients exhibiting developmental dysplasia of the hip (DDH). We are interested in developing a computer-assisted surgical system with modules for preoperative planning and intraoperative guidance. To this end, we employ preoperative image processing to segment bony anatomy and discrete element analysis (DEA) to analyze the contact pressure distribution on the hip. Intraoperatively, we navigate using an infrared tracking system and provide real-time updates (both visual and quantitative) to the surgeon regarding the acetabular alignment.